This is a guest blog post written by Stephen Tweed, CSP, who is the CEO of Leading Home Care...a Tweed Jeffries company. Stephen is an internationally known health care and business strategist, award winning professional speaker, published author, and consultant to the home care industry. Every agency owner, CEO, and administrator truly believes that their agency gives great service and that they give better service than their competitors. Over the years in my seminars and workshops, I’ve asked participants “Who believes your agency gives better service than your competitors?” Nearly everyone raises their hands. Everyone in your agency suffers from the Lake Wobegon effect … you think you are better than you are and your service is better than it is. Service in this country is so bad that you can offer above average service and still stink. Assume your service is bad. It can’t hurt and it will force you to improve. When researchers asked students to rate themselves in their ability to get along with others, 60% rated themselves in the top 10%. In the early 1980s, General Motors got the quality religion most famously expressed in Ford’s theme, “Quality is Job One.” GM surveyed customers and found they were far more satisfied than before the quality initiative. Funny thing happened, “Satisfied” and “Very Satisfied” GM customers went out and bought Toyotas, Hondas, and Fords. Fewer than half of “satisfied” customers bought the same GM make again. 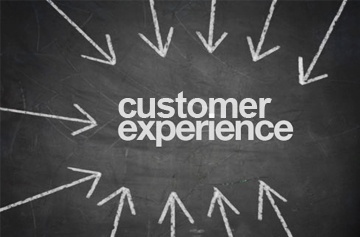 Stop measuring “client satisfaction” and start creating exceptional customer experiences. Fourteen years ago, my wife Elizabeth decided it was time for a new car. She traded in her 10 year old Cadillac that she loved and had bought with cash, for a brand new Lexus LS400. She loved that car even more, and drove it for 14 years. Not only did she love the car, she loved the experience of going to the dealer. Now how many people can say they love going to the car dealer for service, but our friends at Sam Swope Lexus have made getting your car serviced an Exceptional Customer Experience. At the time, I was driving a Honda Pilot, which was my yard truck. I drove it back and forth to the office, back and forth to the airport, and for hauling important stuff like canoes, kayaks, bikes, mulch, and fire wood. When it was time to trade the Honda, Elizabeth talked me into looking at the Lexus SUV. I couldn’t see myself in a Lexus and I couldn’t see myself hauling mulch in such an expensive SUV. After going to visit the Lexus dealer, and having another Exceptional Customer Experience, I’m now driving a Lexus RX350 and loving it. And I, too, love taking my car for service. Go figure. While I was “very satisfied” with the Honda and the Honda service, it wasn’t enough to keep me as a customer. If you really believe that your greatest strength is customer service, and you want to compete in the home care marketplace based on an Exceptional Customer Experience, then there are some things you will need to do. They don’t want a job, they want a relationship. We’ve seen this in home care as we have studied caregiver turnover. What do you do to surprise your clients or families in a positive way? How do you know they are happier as a result of having the care experience with you and your company? What value do you provide and how do your clients know they have received it? What can you do to encourage them to tell others about their exceptional experience? If you and your team believe that you can differentiate your agency from your competitors by creating exceptional experiences for your patients, family members, and referral sources, then you’ll want to download the free research report from Delta Health Technologies.